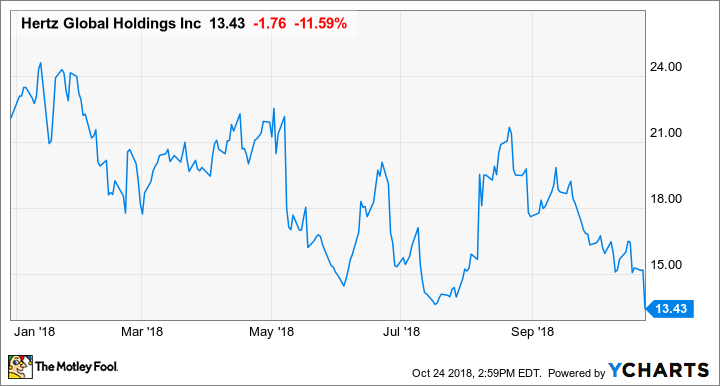 What's Driving Hertz Global Holdings 11% Lower Today? Here's what investors should take away from Hertz Global Holdings' 11% drop today. Shares of Hertz Global Holdings, Inc. (NYSE:HTZ), a vehicle rental service with brands such as Dollar, Thrifty, and Firefly -- and of course its namesake Hertz -- are down 11% as of 2:50 p.m. EDT Wednesday, as broader markets continue to slide. Hertz isn't alone today: Competitor Avis Budget Group is also down 8% with no direct news, and broader industrials and consumer discretionary sectors are moving lower. Despite a lack of direct news tied to the lower stock price, Hertz did announce today it has appointed InterGlobe Air Transport Ltd. (IGAT) as its exclusive general sales agent in India. IGAT, with its 29 years of experience in India's travel industry, will manage sales of products and services for all Hertz brands. The India outbound market represents a great opportunity for Hertz and we are very pleased to extend our partnership with IGAT to a sole agent basis. IGAT is an experienced operator, managing a wide travel distribution network and extensive corporate customer base across India. IGAT is ideally placed to grow the presence of The Hertz Corporation's car rental brands in India and provide outbound travellers with a wide choice of car rental options around the world. Investors should focus not on today's dip, but on the company's upcoming third-quarter financial results on Nov. 8. Although Hertz still faces challenges, it's coming off a strong second quarter: Total revenue jumped 7% and its net loss improved by 60%, both the top and bottom lines beat analysts' estimates, and the stock popped 27% after results were announced. If the company's momentum continued into the third quarter, there's a good chance this dip will be forgotten rather quickly.